The film that officially signaled Disney's animation renaissance (following The Little Mermaid) and the only animated feature to receive a Best Picture Oscar nomination, Beauty and the Beast remains the yardstick by which all other animated films should be measured. It relates the story of Belle, a bookworm with a dotty inventor for a father; when he inadvertently offends the Beast (a prince whose heart is too hard to love anyone besides himself), Belle boldly takes her father's place, imprisoned in the Beast's gloomy mansion. Naturally, Belle teaches the Beast to love. What makes this such a dazzler, besides the amazingly accomplished animation and the winning coterie of supporting characters (the Beast's mansion is overrun by quipping, dancing household items) is the array of beautiful and hilarious songs by composer Alan Menken and the late, lamented lyricist Howard Ashman. (The title song won the 1991 Best Song Oscar, and Menken's score scored a trophy as well.) The downright funniest song is "Gaston," a lout's paean to himself (including the immortal line, "I use antlers in all of my de-co-ra-ting"). "Be Our Guest" is transformed into an inspired Busby Berkeley homage. Since Ashman's passing, animated musicals haven't quite reached the same exhilarating level of wit, sophistication, and pure joy. --David Kronke --This text refers to an out of print or unavailable edition of this title. item not good, but GREAT communication ! A entertaining movie with profound messages of love and inner beauty. 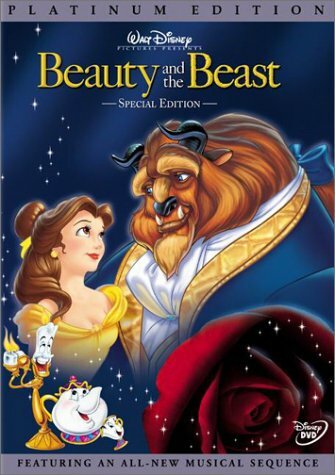 Beauty And The Beast happens to be my all time favorite Disney animated movie. I saw it in the theater at least 4 times when it was first released in 1991 and I must have watched it a dozen or so times since then. There are several reasons why Beauty And The Beast is my favorite Disney movie. For one, Belle is a heroine that many young women today can definitely relate to. Her love of reading, the fact that a man being handsome alone doesn't impress her (Gaston) and her curiousity about things makes her personality very realistic and endearing. Another reason why Beauty And The Beast is my favorite is the music. I've never enjoyed the music in a Disney movie as much as I have this one. The clever and sometimes touching lyrics draw you in and make one caught up in the story. Songs such as "Belle", "Gaston", "Something There" "Be Our Guest" and of course the title track add so much to the overall story and give the viewer a deeper understanding of the characters. Yet another reason is the animation. True, there are many Disney movies where the animation is dazzling, however, I'm just so drawn to (no pun intended) the animation in this movie. The scene that impresses me the most is the one where Belle and The Beast dance while Mrs. Potts sings the title song. The combination of tradiditional and computer animation has the end result being such a stunning and beautiful scene. Probably from an artistic point of view (not to mention an emotional point of view), my favorite scene from the movie. Finally, lets not forget the story itself. I think the meaning of it is beautiful. It's about looking at the person's inside and finding the true beauty of someone's soul, which is Belle's POV. I think we all forget sometimes about that, and this movie is a lovely reminder of that. Another lesson is how people can change, can learn and grow, which is the Beast's POV. It also demonstrates how love conquers all things, even when you think all hope is lost (the last petal of the rose falling after Belle tells the Beast that she loves him). That is a profound message.